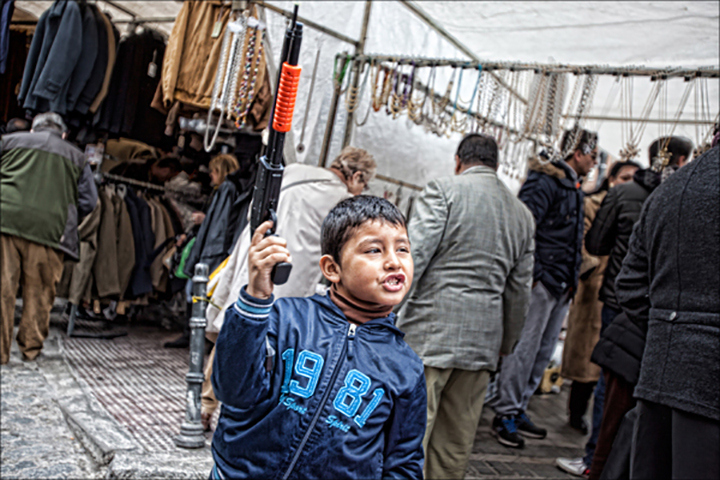 I was in a very crowded street market when I noticed this little boy playing with a toy rifle. This could be anywhere in the world. He seemed to be looking for attention and fascinated with his toy . His uncanny gestures seemed to be mimicking the "power" a grown up might display when yielding such a lethal weapon. We are seeing this too often in our society today. This was clearly a small innocent child imitating someone he had seen either in a movie, on TV, a video game or an adult. Aside from background checks , the 2nd amendment , and so on, what role do social conditions i.e. 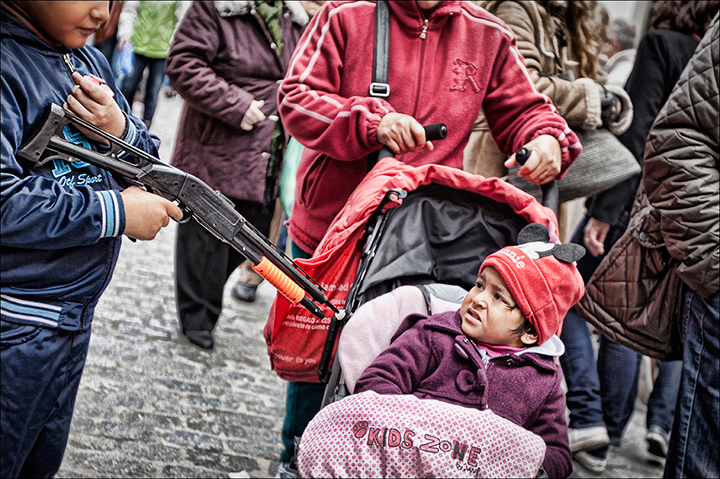 : inequality on many levels in the US and worldwide have on gun violence? Should toy guns be banned ? Open for comments , opinions and suggestions on how to stop gun violence. ~~~~~~~~~~~~~~ "I Don't Like Mondays" is a song by Irish band The Boomtown Rats that was a number one single in the UK Singles Chart for four weeks during the summer of 1979, and ranks as the sixth biggest British hit of 1979. Written by Bob Geldof, it was the band's second number one single. According to Geldof, he wrote the song after reading a telex report at Georgia State University's campus radio station, WRAS, on the shooting spree of 16-year-old Brenda Ann Spencer, who fired at children in a school playground at Grover Cleveland Elementary School in San Diego, California, US on 29 January 1979, killing two adults and injuring eight children and one police officer. Spencer showed no remorse for her crime and her full explanation for her actions was "I don't like Mondays. This livens up the day". The song was first performed less than a month later.